CHICAGO – If there ever was an industry that deserved a good metaphor bashing, it would be the financial sector. “Killing Them Softly” does a hit-over-the-head with the symbolism, but at the same time delivers a gritty and literate parable, featuring Brad Pitt, James Gandolfini and Ray Liotta. 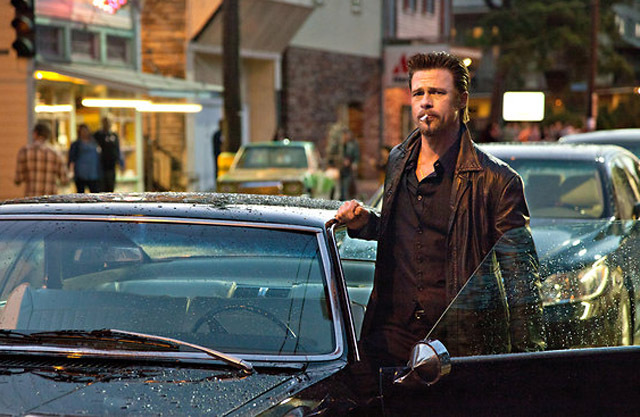 “Killing Them Softly” has ultra violent moments, including an extended human beating and an artsy slow motion gunshot to the head. But mostly it’s guys sitting around in cars and diners – baptized by rainfall – musing on the power structure of life, while alternately getting burned or surviving within it. Meanwhile, the 4th quarter 2008 financial collapse is in the background, and it’s obvious the film wants to draw comparison between lawless criminal activity and government sanctioned criminal activity. This is effective, especially when assigning aspects of the financial industry to the actions of the small-time larceny portrayed in the characters. Either way, we’re all dead. The film opens with Johnny Amato (Vincent Curatola) hiring a small time hood named Frankie (Scott McNairy) to pull off an audacious robbery. Frankie brings along Russell (Ben Mendelsohn) for the job, even though Johnny doesn’t trust Russell’s tendency toward incompetence. They are robbing a poker game run by Markie (Ray Liotta), and the kicker is because Markie once robbed his own poker game and admitted it, that this robbery will also be mistaken as an inside job. The successful heist is pulled off, and this sets off a series of events which involve Jackie (Brad Pitt) and Driver (Richard Jenkins). Jackie is a hit man who is coordinating the punishment of Markie, and Driver is the mouthpiece for the upper echelon of the criminal organization. They find out about the robbery scam, and suddenly a number of people need to be whacked. They bring in help in the form of another hit man named Mickey (James Gandolfini), but his erratic nature adds complications to the death sentences. It’s Jackie to the “rescue,” as he is charged with straightening it all out and dispensing the proper punishments. Film Review: Advocacy Film ‘Bully’ is a Must See, But for Who?